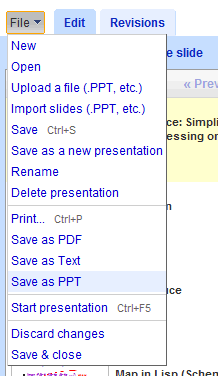 Good news for all users who use Google Presentations in Google Docs. All your presentations in Google Docs can now be exported into powerpoint (PPT) slides which essentially means that you can use Microsoft Office or OpenOffice to open your presentation file. Don’t have Microsoft Office locally on your computer and need a presentation done? Use Google Docs! I can’t get this to open in Microsoft Powerpoint. I have tried saving it as a .PPT but each time I try to open it using Powerpoint it gives me an error. Is anyone else having this problem? YES! I’m getting the same thing; it’s some sort of bug with Office 2007 I think. It says that it can’t open the location because there is no text converter installed.